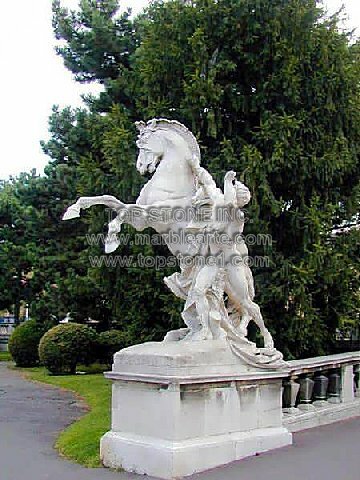 Description: TSAL189 - White Horse Gallop Marble Sculpture - If you take a look at the marble statues in London, you will find that marble horse statues take preeminence. That’s why White Horse Gallop is a special creation designed as vintage marble statues that, with its careful hand carved marble handiwork affords unique garden statues for you. By visiting any sculptures for sale outlet, you are free to play about with this ingenious Italian marble creation, by centering them not only to patio statues, but also as landscape statues and garden memorials.